Huawei heavily credits its meteoric rise in the consumer tech industry to its customer-centric business values. The company succeeded as it did by understanding what consumers wanted and making them possible time after time. This fervent “Make it Possible” mantra was exemplified when Huawei Consumer Business Group CEO Richard Yu famously predicted in 2015 that Huawei would become the number one smartphone maker in the world within three to five years – this 2018 the company took the #2 spot globally, making in right on track to accomplishing its goal. In terms of its innovations, Huawei gathered feedback from its customers and implemented them in developing new technology for their products, such as the Kirin series chipsets, Leica cameras, and power-efficient batteries. These innovations helped improve user experience across the board and in turn, catapulted Huawei devices to achieving major critical and consumer acclaim. It was with that objective that Huawei introduced the Nova 3i to the Philippine market – and immediately saw incredible success. 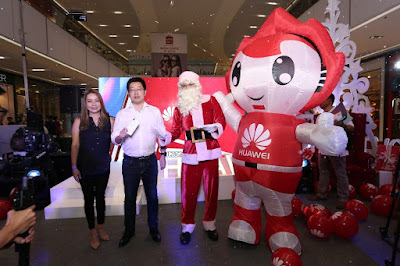 Filipinos have been overwhelming in their support of Huawei products in the last few years and to show gratitude, the company decided to make their fans’ fantasy of a snowy Christmas possible this year. That’s right: Huawei makes the dream of countless Filipinos come true by making it snow in the Philippines! People can get to see these wonderful snow shows in events fittingly called Make Snow Possible which happened last December 1 at SM Aura, Taguig. Doubling as a year-end Thanksgiving event for its loyal user base, Huawei’s snow shows offer a unique Christmas experience to attendees. Guests can play around amongst the falling white flakes while enjoying the wintery atmosphere accompanied by themed music and lights. In addition to the snow show, guests can explore dedicated hands-on booths showcasing all the latest Huawei products. 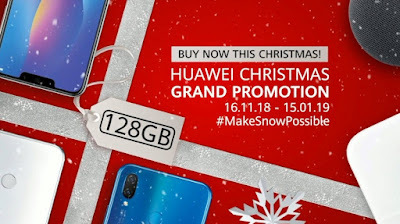 Speaking of, the Make Snow Possible campaign lets Filipino consumers get the Huawei Nova 3i in a much-requested pearl white color option – a special Christmas gift from Huawei to its loyal user base.